This feature is in beta stage. To share your experience, please contact us. We plan to improve this feature. 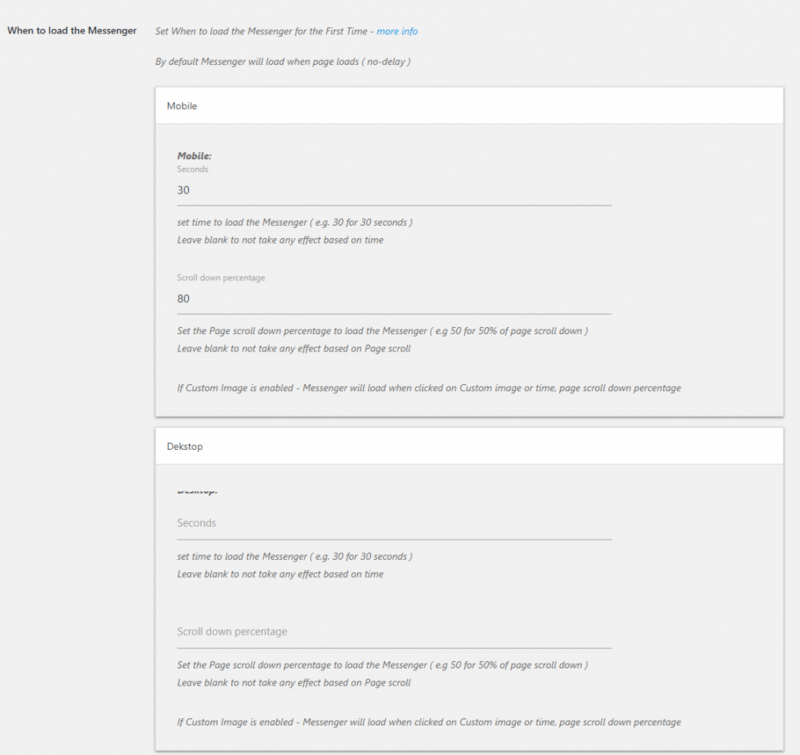 The plugin adds the messenger on websites by using Facebook Customer Chat SDK. Customer chat SDK loads asynchronously, So it won’t stop loading other elements. Call SDK after page loads – After page loads call SDK and display messenger. until your web page loads – less than 1KB(approx 500 Bytes) of content will add to your website, other then this your web page won’t cause any effect due to the plugin, messenger. +4 Seconds after page loads – After page loads and after 4 seconds calls SDK and display messenger. This benefits at page speed metrics (GTmetrix or similar), SEO. +2, +3 seconds we tested, some situations it’s not given expected result, so +4 added. In pro version can test and set any time. We recommend to enable this both features ( After page loads and after 4 seconds, SDK will call and maybe it 2 seconds messenger will display, so a few seconds delay of displaying messenger will benefit a lot ). This feature is built for pro version, but as page speed is the most important factor for most users, moved this feature to free version. In PRO version can set time to call SDK, and can set time to display messenger. based on image, After web page loaded and after 10 seconds, call SDK and Display Messenger. In pro Version after SDK called, can also set When to load the Messenger. based on the above two images – after web page loads and after 10 seconds call SDK. Mobile: After SDK loaded, display messenger after 30 seconds or after user scroll down 80% of the page.